This post is about a classic Valencian dish and the accompaniments we had for our Saturday lunch this week. Agriculturally, Valencia is the orange producing area of Spain but there is another crop which is important in this Mediterranean region and is often overlooked. I not sure why this is but it is. I am talking about rice.Some of you will already know this but Valencia is a huge producer of rice, although behind Sevilla and Extremadura in volume produced . Spain produces about 750,000 tons a year, of which nearly two thirds is exported. In Valencia the rice is produced in the Albufera(a fresh water lake very close to the coast) area, where the paddy fields are flooded annually and produce a variety of rice which has a Guarantee of Origin. Introduced by the Moors, rice quickly became part of the staple diet in Valencia. Paella is the principal and most famous dish to come from Valencia and today has many different and tantalising recipes. But today I am going to talk about another delicious local dish which is also made from rice: “Arroz al Horno” (Rice baked in the oven). This recipe is a classic in the region and much loved by Valencianos.There are various cooking competitions in the region to find where the best cooked dish comes from. Xativa celebrates its annual “Concurso Nacional de Arroz al Horno” which draws three thousand members of the public to try the delights. Prestigious restaurants from all over Valencia battle to show their skills at producing the best “Arroz al Horno”. 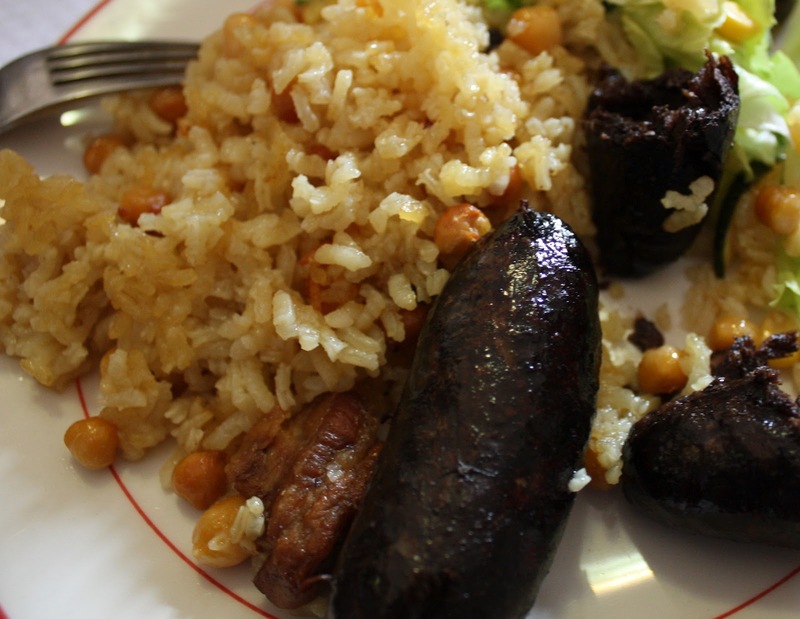 The ingredients are pretty simple: rice, pork ribs, pork belly, black pudding, chick peas,garlic and saffron. These ingredients vary from town to town and village to village e.g. some people put slices of tomato and potato on the top of the dish. The result is an exceptionally tasty meal. Blue cheese with Tomato Jam on rosemary crackers and Manchego with Spicy Tomato Chutney.Special thanks to Natalia (my daughter in law) for her homemade jam and chutney. Drinks: beer and an excellent local white wine: “Reixiu” white wine from Bodega Heretat de Taverners. The “Arroz al Horno” served with Salad and a very interesting red “Paquito El Chocolatero” from Celler La Muntanya. Followed by Strawberries in freshly squeezed orange juice. And ,of course, a big thanks to Julia,my wife, for her hard work in the kitchen. And to finish up, a question: Where,according to most Spanish chefs,does the best rice come from in Spain? 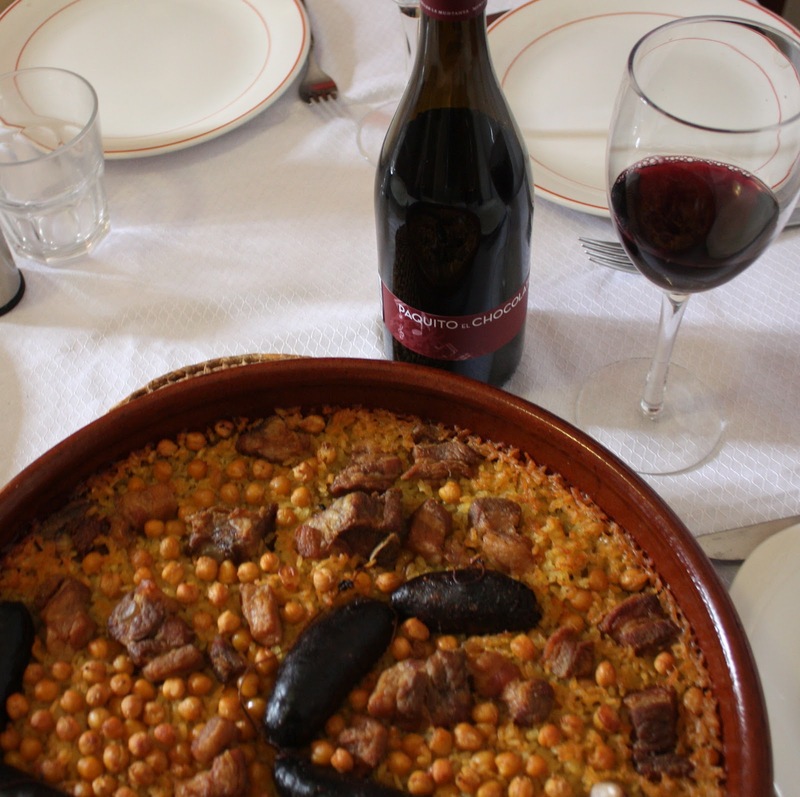 This entry was posted in cultural traditions, spanish food, traditonal recipes and tagged cultural holidays, gastronomy, spanish food, Valencia, wine by Paddy Waller. Bookmark the permalink. I love Spanish food and this recipe looks amazing!